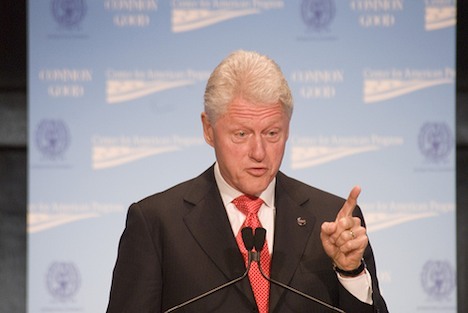 Former president Bill Clinton has attacked Republican presidential candidates for their positions on climate science. At an event launching the seventh annual Clinton Global Initiative conference in New York, Clinton said Republican candidates’ skepticism about climate change is making the United States “look like a joke”. In addition, Clinton encouraged the American people to force conservative politicians to acknowledge human driven climate change in the lead-up to the national election. He said that voters need to make it “politically unacceptable to engage in denial”, in relation to climate change. Clinton also mentioned that the lack of debate in the U.S on climate change is “really tragic”. He added that what is needed is for people a little bit to the left, and a little bit to the right to debate what the best, fastest and most economical way is to reduce greenhouse gas emissions. The climate change debate (or lack thereof) is currently far from the situation Clinton suggests, with Texas Governor and presidential contender Rick Perry flat out saying that he doesn’t believe climate change is real, and that he thinks scientists are manipulating data “to keep the money rolling in”. Massachusetts Governor Mitt Romney, another presidential contender, has said he thinks the world is getting hotter but he doesn’t know if it’s mostly caused by humans. Jon Huntsman is the only Republican candidate who has publicly stated that climate change is real and caused by humans. Do you agree with Bill Clinton that the stance of the majority of Republican candidates make the U.S. look like a joke in the eyes of the rest of the world? What are your thoughts on the issue?